Description Apply random noise attenuation via spatial predictive deconvolution in the complex frequency domain. This process performs random noise attenuation via spatial predictive deconvolution in the complex frequency domain. Deconvolution operators are designed in the lateral (X) dimension to predict the coherent parts of the signal. Subtracting the coherent parts will leave the incoherent parts, i.e. random noise which can then be inverse transformed and subtracted from the signal. 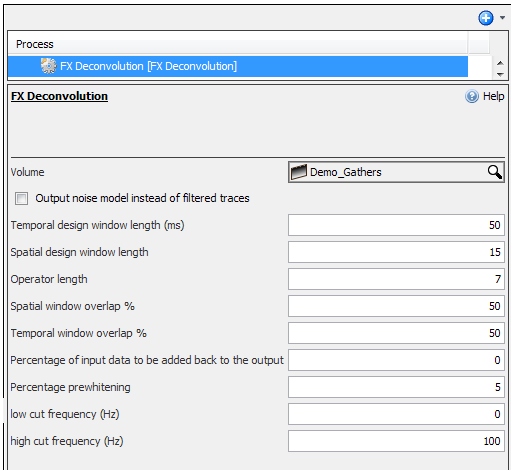 Select FX Deconvolution and type a name for the process. Temporal design window length (ms) — Enter the length (ms) of the temporal design window (Default: 500ms). Spatial design window length (traces) — Number of traces in the design window (Default: 15). Operator length (traces) — Enter the operator length in traces (default: 7). Spatial window overlap (%) — Enter the spatial window overlap in percent (default:50%). Temporal window overlap (%) — Enter the temporal window overlap in percent (default: 50%). Percentage of input data to be added back to the output (%) — Percentage of input data to be added back to the output (Default: 0%). Percentage prewhitening (%) — Enter the percentage prewhitening (Default: 0%). low cut frequency — 0 lowcut frequency in Hz. high cut frequency — Nyquist if not specified. Tip: Use Insight's on the fly processing to make quick updates to the input parameters. 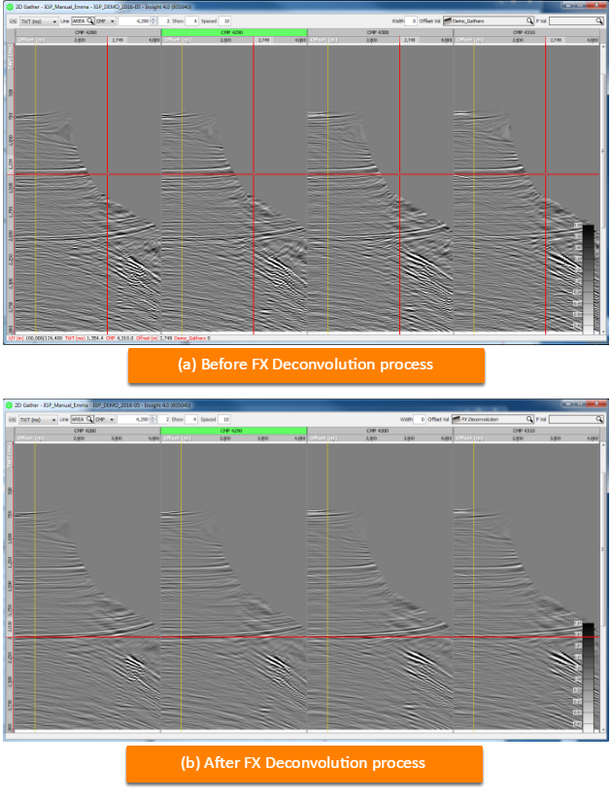 Insight will automatically update the viewed FX Deconvolution volume to show the effect of the new input changes. 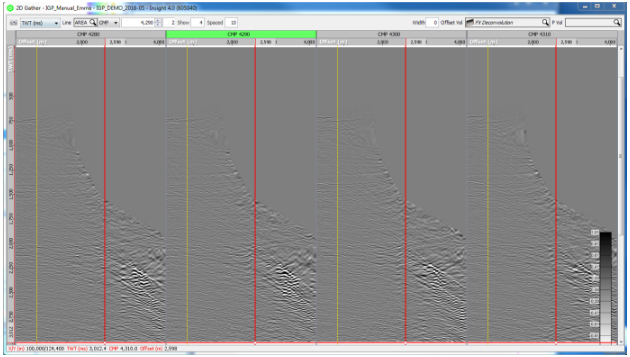 Select Output noise model instead of filtered traces.